Which do you want to hear first? The good news or the bad news? I am often asked that question. I always want to hear bad news first so we'll go with that. I received an email letting me know that the prices we (Hugs for Hailey) pays for necklaces are going up. *Sad face here* From today on, until I can figure something else out, Hugs for Hailey necklaces will be $15.00 each. So that's the bad news. The good news is that Hugs for Hailey is expanding by offering more choices and also something I have been working on for a little while...ready for it? 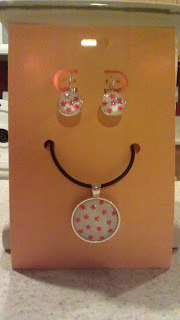 Create your own necklace and even add Matching Earrings!!! So instead of just having the shiny silver plate backing you can pick either the shiny silver back, a black back, a copper back or an antique silver back plate!! You will be able to pretty much customize your Hugs for Hailey necklaces also. Pick your base color, add crackle, sparkles, or stars. Colorful Stars with Sparkly purple background. Necklace and Matching Earrings $25! Super Pink Sparkles. 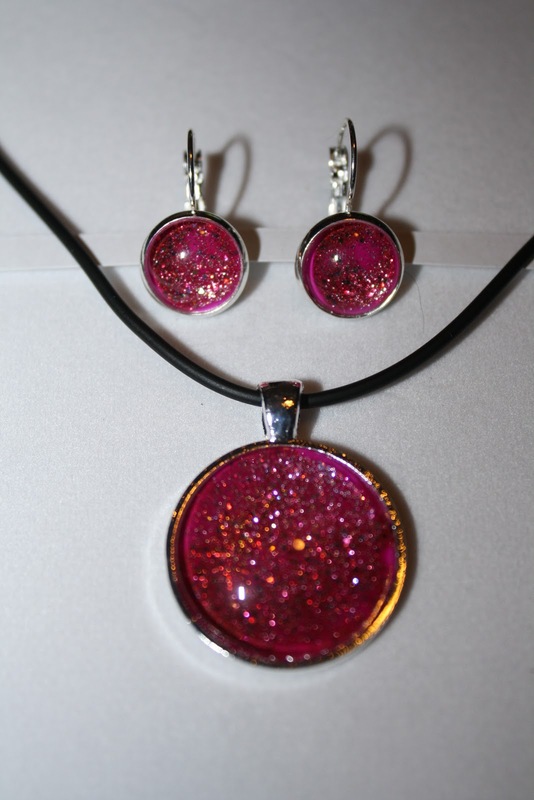 Necklace and matching earrings $25! 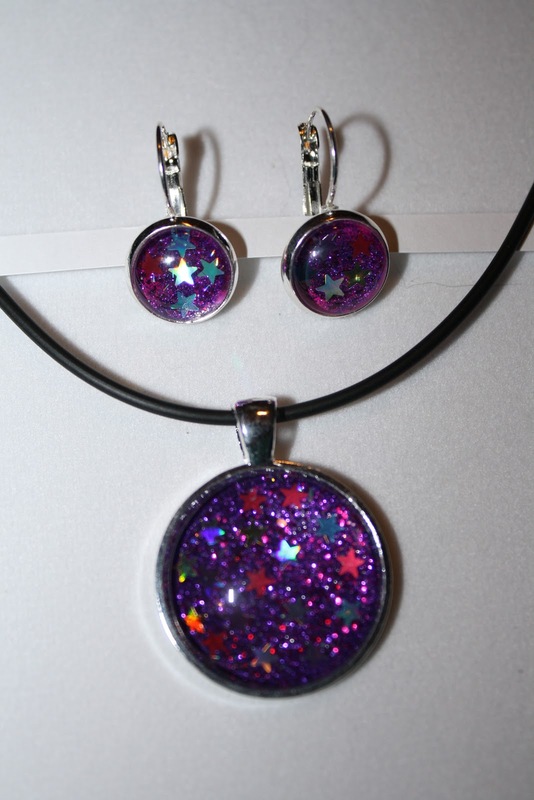 Necklace and matching earrings $25! Every time I see this picture I see a smiley face...Odd? Hugs for Hailey Necklaces are $15 each. You choose your backing plate and how you want your necklace to look. You can go to the tab at the top where it says Order a Customized Necklace or Earrings or you can go to this link also. Just fill out the form. Earrings are $15 each pair. Earrings ONLY come in the Shiny Silver Backings that are Nickel Free. You choose how you want your Necklace and earrings to look. You can buy a complete set of a necklace and a pair of earrings for $25!!! You can visit our Etsy Shop and pick from already made necklaces or a necklace and earring set or just a pair of earrings if you want! SO....I have been working on this all by myself for the past MONTH and I am ready to go LIVE...I think. Honestly I have never had an Etsy shop and I have never worked in google documents so I am hoping everything goes how it's suppose to and if there are any bugs or problems you will let me know. I really want to spread Hailey's story and I think this will help. Thank you to all who have supported us in helping Hailey! !